People, gardening, flower planting and profession concept - close up of woman or gardener hands planting roses to flower pot at home. Woman's hands transplanting plant a into a new pot. 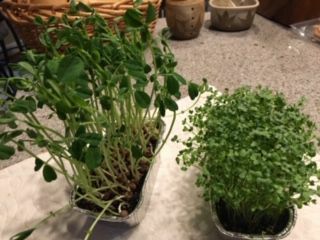 Growing soil-based indoor salad greens boosts your morale, gives you easy access to fresh, nutrient-dense foods while being easy and affordable. Let’s be honest. It’s easier to eat healthy when there are loads of delicious, freshly harvested fruits and vegetables available. In Ontario County, that kind of choice is only available for half the year. During the throes of winter, when sunshine is a rare commodity and warmer temperatures exist only in dreams, accessing fresh produce can be challenging. Indoor gardening is one way to bring a slice of summer into your life and onto your plate any time of year. Indoor gardening is simply the art of raising plants indoors. For some, this means a few houseplants. For others, it can mean an entire indoor nursery complete with sunrooms. Indoor gardening also refers to growing and harvesting edible plants indoors during the offseason. Many avid gardeners get a jump start on their outdoor vegetable gardens by starting their plants from seeds indoors. This allows them to plant established seedlings that have been growing, without the worry of frost damage. Diane Foster, Deputy Clerk to the Board of Supervisors and a Wellness Champion for the Ontario County Municipal Building, used to start tomatoes, squash, peppers and even geraniums indoors near the end of February and into March. For her, gardening is a passion. “Before marriage and kids, I worked for a farmer and started going to school for nursery management,” Foster says. For her seedlings, Foster used a fluorescent light she borrowed from her father and found a spot in her house that was warm enough to germinate the seeds. When her kids were younger, she loved having them help water and watch the plants grow. “It’s therapeutic to nurture something and see it growing,” Foster says. Ebberts based the class on a book by the same name, authored by Peter Burke. Burke has developed a simplified way to grow nutrient-dense, soil-sprouted greens indoors that can be harvested for salads and stir fries within seven to 10 days. No special equipment is required beyond a few shallow loaf pans (disposable ones are fine and can be reused), a bit of potting mix, fertilizer and newspaper. “If you have enough light to see, you have enough light to grow sprouts,” Ebberts says. There are loads of benefits to growing your own sprouts. Not only does it lift your spirits by bringing green freshness during winter, but you get to experience the satisfaction of growing your own food. Sprouts are filled with proteins, vitamins and micronutrients your body craves. Plus, if fresh sprouts are easily accessible, you are more likely to choose these additions to your salad for nutrient-dense flavor as opposed to less healthy options such as cheese, croutons or too much salad dressing. Speaking of flavor, sprouts are crisp, sweet, nutty and even spicy, depending on which greens you grow. If making you feel good physically and mentally isn’t enough, sprouts are also economical. One bag of seeds can last more than a year, even if you’re planting every other week. Foster plans to use the large window at her office for her greens. “The indoor aspect also appeals to me because it’s not back-breaking work,” she says. If growing indoors interests you, call the Cornell Cooperative Extension Ontario County at 585-394-3977, ext. 427. Your name will be put on a list, and if there are enough requests a class will be scheduled. Burke’s book, “Year-Round Indoor Salad Gardening: How to Grow Nutrient-Dense, Soil-Sprouted Greens in Less Than 10 Days,” is available at the Ontario County Library.